Yesterday we came across a really helpful breast cancer website. It’s called Ticking Off Breast Cancer and it’s written by Sara, a cancer survivor living in the UK. During Sara’s own cancer journey, she found online breast cancer websites completely overwhelming and often came across lots of things about breast cancer that she didn’t wish to know. She wanted to talk to someone who had been through everything already and who would hold her hand and tell her what to do. She wanted a website which gave her practical advice in one easily accessible place where she didn’t have to go through link after link trying to work out if the information was relevant or not, whilst trying to avoid the “scary stuff”. Sound familiar? We know we felt exactly the same. When she didn’t find that website, she did all that was left to do – she researched around, separated the wheat from the chaff, noted down a few to-do lists, shopping lists and action plans and put one foot in front of the other along the well-trodden cancer path. 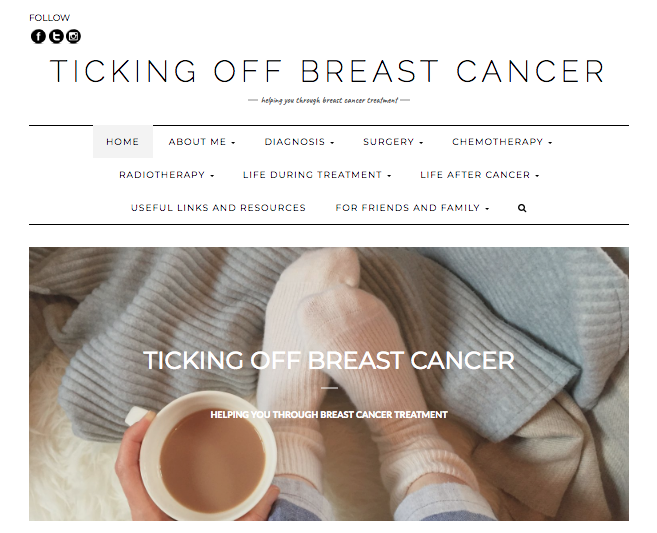 When her treatment came to an end, she decided to put all her new knowledge (and lists) to use and created Ticking Off Breast Cancer – the website that she had longed for at the start of her own journey. Sara likes to think that someone embarking upon their treatment for breast cancer could start at ‘Diagnosis’ and keep going to ‘Life during treatment’. But you can also dip into any category at any time: it doesn’t matter at which stage of the breast cancer journey you may be. Within each of these categories are lists. To-do lists, shopping lists, need-to-know lists and bullet point lists, all of which are based on Sara’s experience. At the end of each page she provides some links to additional information that is available online. So if you would like more information but don’t know where to go, these links are an excellent starting point. This website steers clear of anything other than practical advice based upon Sara’s own experience. She doesn’t talk about the different types of breast cancer or cancer statistics, stages and grades. She doesn’t discuss clinical trials, alternative therapies, prognosis, recurrence or causes of cancer or talk in medical terms. Instead she provides plenty of signposts to where you can find that sort of information if you wish to read about it. Sara has done a lot of online research and has only included links to (in her opinion) reputable external websites. Some links are to the relevant pages of well-known cancer organisations (such as Cancer Research UK, Macmillan, Breast Cancer Care). Some links are through to lesser-known organisations, but ones that in her opinion can provide something over and above her website or the larger organisations (such as Look Good Feel Better, Nourish by Jane Clarke and Your Sim Pal – to name just a few). She has also put in links to places where you can buy specialised cancer-related products – things that will help you through your treatment – from online shops that you may not have come across (such as Live Better With Cancer, Drain Dollies, Not Another Bunch of Flowers and Defiant Beauty). We’ve found quite a few new resources from Sara’s site. We also love Sara’s blog posts about anything and everything to do with the cancer journey, from Silver Linings to the Dark Cloud of Breast Cancer and Walking Your Way to Healthy to 5 Things I Wish I Had Known When Diagnosed with Breast Cancer and What To Ask the Chemo Nurses Before Your First Chemo Cycle. We think Sara’s website is an amazing resource and encourage you to check it out for yourself. Visit Ticking Off Breast Cancer here.